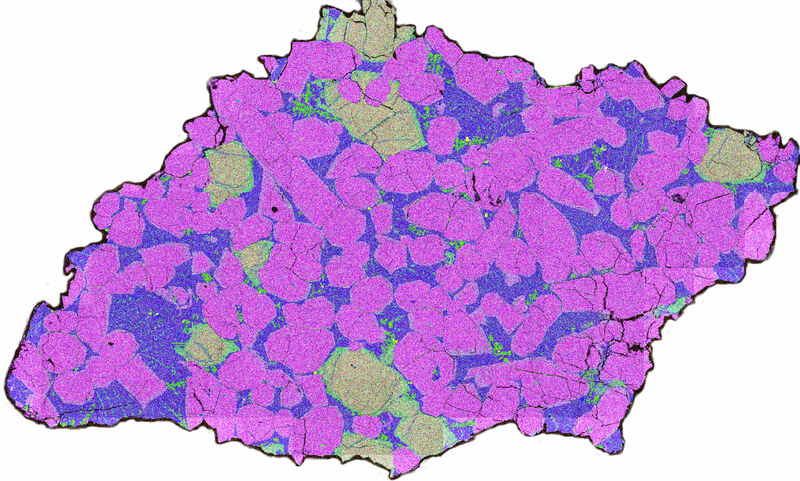 Thin section of the Martian meteorite MIL 090030 analyzed by the UHNAI researchers. 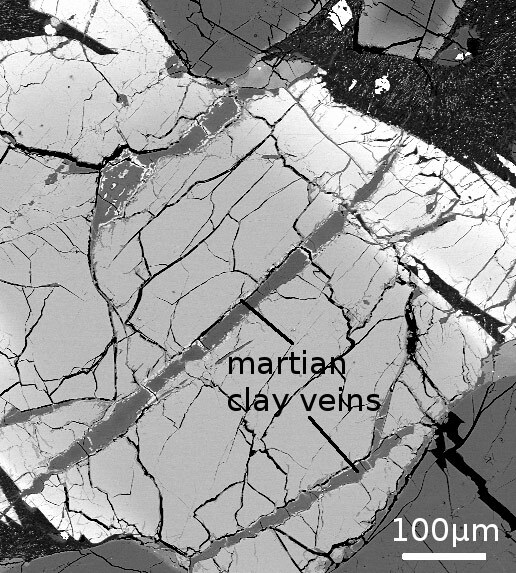 A newly published study details the discovery of a high concentration of boron in a Martian meteorite that far exceeds that of any previously reported extra-terrestrial object. The Antarctic Search for Meteorites team found the Martian meteorite used in this study in Antarctica during its 2009-2010 field season. The minerals it contains, as well as its chemical composition, clearly show that it is of Martian origin. Using the ion microprobe in the W. M. Keck Cosmochemistry Laboratory at UH, the team was able to analyze veins of Martian clay in the meteorite. 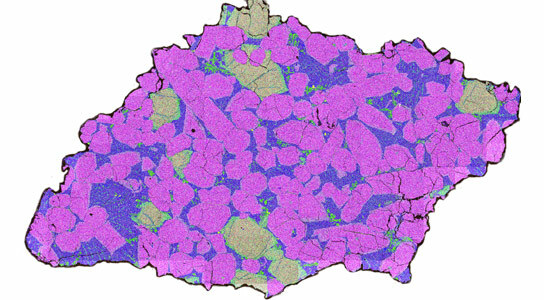 After ruling out contamination from Earth, they determined boron abundances in these clays are over ten times higher than in any previously measured meteorite. “Borates may have been important for the origin of life on Earth because they can stabilize ribose, a crucial component of RNA. In early life RNA is thought to have been the informational precursor to DNA,” said James Stephenson, a UHNAI postdoctoral fellow. RNA may have been the first molecule to store information and pass it on to the next generation, a mechanism crucial for evolution. Although life has now evolved a sophisticated mechanism to synthesize RNA, the first RNA molecules must have been made without such help. One of the most difficult steps in making RNA nonbiologically is the formation of the RNA sugar component, ribose. Previous laboratory tests have shown that without borate the chemicals available on the early Earth fail to build ribose. However, in the presence of borate, ribose is spontaneously produced and stabilized. On our planet, borate-enriched salt, sediment and clay deposits are relatively common, but such deposits had never previously been found on an extraterrestrial body. This new research suggests that when life was getting started on Earth, borate could also have been concentrated in deposits on Mars. The presence of ancient borate-enriched clays on Mars implies that these clays may also have been present on the early Earth. Borate-enriched clays such as the ones studied here may have represented chemical havens in which one of life’s key molecular building blocks could form. UHNAI is a research center that links the biological, chemical, geological, and astronomical sciences to better understand the origin, history, distribution, and role of water as it relates to life in the universe. 3 Comments on "Martian Meteorite Contains Chemical Implicated in the Origin of Life"
and evidence of the incredible lack of evidence for organic chemicals to staggeringly complex first cell. Why not accept the obvious? Well stated, Lew! Bravo! Although I’m surprised you didn’t go on to state the obvious. Without such exploitation of the Media, the Sciences are left underfunded and jobs are at risk so, ‘Subtle Innuendo’ goes a long way. The Public Perception has been fired-up by being spoon fed on the concept of ‘Martians’ with spindly arms and legs and grotesque features put out by ‘Movie-makers’ designed to scare the pants off us all in the name of, ‘Money’ Not, ‘Unequivocal Fact’. In truth. There is no, ‘Life’ on Mars.. Never has been, never will be! Unless ‘We’ visit of course.I know because I studied the subject very intently and comprehensively for ten years taking in ‘Miller’ and all who followed him and not one of them managed to work out the parameters required to produce, ‘Life’! I, DID! Keep up the good work, Mate! It might take a hundred years but, one day You and I may be able to convince the rest of humanity how much they are being ‘Taken for a Ride’! Dear Peter O’ Connor! Scientists are not children seeing cartoon films to believe that Martian Man existed with spindly arms and legs as you imagine. They come to the conclusion based on the basic facts of science. If you want your ideas to be sold, please uproot the basics with your own hypothesis from the scrap to arrive at your conclusions. Discovery comes out of discussion and debates but that should be wholesome and not empty shells. You know that writing Periodic table, you will find the order Hydrogen, Helium, Lithium, Beryllium, Boron, Carbon, Nitrogen, Oxygen, Flourine, Neon, Sodium, Magnesium, Aluminium. Silicon, Phosphorous, Sulphur, Chlorine, Argon, Potassium, Calcium… etc are the first 20 elements of formation in cosmos by nucleo synthesis. Why I am adducing this because, Boron happens to be the neighbor of the most important element CARBON, and it aids synthesis of many hydrocarbons in nature. That is why, the borates found in clay which was surprisingly found embedded in Martian craters scooping the past history of wet soil with alum and other traces of hydrocarbon synthesisers. I had been always telling through my series of articles ( Please read SCIENCE FRONTIERS- A PROBE BY MADAN ) which would be easily available by google , either by the caption itself or by searching under ‘vcmadan2’.I had been boldly putting forth many ideas like “UFO’s are not mathematically possible”and that water the elixir of life is formed in space with adequate dose of radiation and it was brought by comets to many of our planets. That is why you find water of Moon, Mars etc. Please don’t immediately come to the conclusion that water would be available in pure drinkable form . Even on earth it is salt water and in Titan it is alcohol ocean. In some places it will be Sulphuric and Acetic acid etc. The formation of life is cyclic depending upon the chemistry of planets and temperatures. What is bubbling with life today would become barren in future and what is barren today would have been bubbling with life once. The embedding of amino acids being building blocks of life also could have been seeded by comets. The period of life in one planet is infinitesimally small in planets long life of billions of years. Simultaneous concurrence of life beings is absolutely not possible with mathemataical probability. Thank You.